Joseph Joseph worked with inventor/designer Mark Sanders to develop Chop 2 Pot ®. These innovative chopping boards use the latest technology in polypropylene living hinges, when the handle is squeezed the board folds into a chute to guide chopped and diced ingredients into the pot. This product is 38 by 21cm (15 by 8¼ inches approx) when laying flat and the chopping area is a generous 27 by 21 cm (10¾ by 8¼ inches approx). 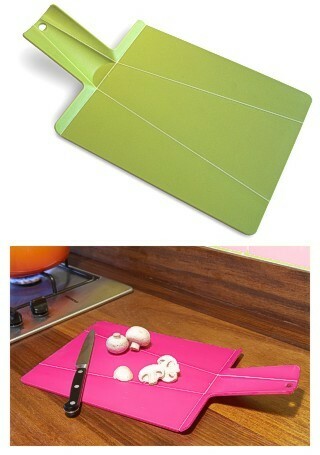 Avoid cross contamination and use different colour boards for different purposes. Price is for a pair of boards, lime green and raspberry pink.